Shown above: 1 Soho Club Chair, 1 Soho Sofa, 1 Soho Round Coffee Table, and 1 Teak Root Accent Table. Imagine a high fashion couture brand of outdoor furniture. 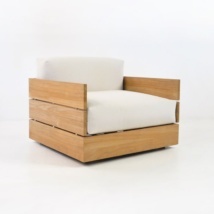 Now, find it in the Soho Teak Outdoor Furniture Collection! Pairing huge, luxurious slats of A-Grade Teak with #316 Stainless Steel tubing, the Soho Teak Outdoor Furniture Collection is the new slick and sleek option for outdoor living. Sunbrella® cushions as shown in canvas are available for immediate delivery. Inspired by the contemporary, polished lines of art galleries, studios and loft living; the Soho Teak outdoor Furniture portfolio is utterly chic and a wonderful addition to indoors or out. Whether you live in an urban city or a suburban area, Soho teak outdoor furniture will infuse your space full of modern charm! The Soho Collection is made up of 5 key pieces: the Soho Outdoor Sofa, Loveseat, Outdoor Lounge Chair, Rectangular Teak Coffee Table and Round Teak Coffee Table. The architecture of each piece of this teak outdoor furniture conceptualizes modern living with 7 inch planks of beautifully kiln-dried A-Grade Teak held together with #316 marine grade Stainless Steel tubing modeled into a slim yet solid frame that contrasts impeccably with the plush Sunbrella® cushions featured on the deep and delightful seating areas! Create a low profile setting to go on your beachfront property with Soho. Start with a lavish Soho Outdoor Sofa, place a Soho Rectangular Teak Coffee Table and frame it with an Outdoor Loveseat and two Outdoor Lounge Chairs. You’ll be enclosed in soft, luxurious comfort and you won’t want to leave! Make your library or great room an up-to-date, stylish area that you can really unwind in. Imagine a group of Soho Club Style Outdoor Lounge Chairs around a Soho Round Coffee Table, perfect for book club meetings, or casual tapas and wine with friends. It doesn’t really get much more comfortable than this! Have a small patio that needs a makeover? Choose a Soho Outdoor Loveseat with a custom Sunbrella® cushion color such as Fern or Glacier to add dimension to your space. 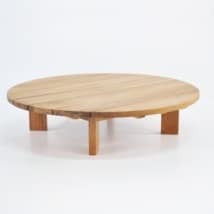 Place a Soho Rectangular Teak Coffee Table in front and add a couple of Raw Concrete Square Stools for an ideal setup for morning coffees, casual lunches and evening drinks. Sunbrella® cushions come FREE with the Soho Deep Seating Collection! 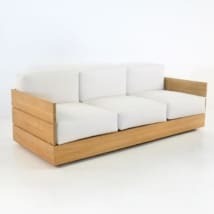 See below for individual items, sizes and prices in the glamorous Soho Teak Outdoor Lounge Collection! If you love this suite of Teak Outdoor Furniture but wish to go EVEN grander?! Teak Warehouse now carries Soho Grande, the plus size version of this amazing set. Just go to Seating Collections or type ‘Soho Grande’ into our search bar.